Meet 15 year-old Bianca. 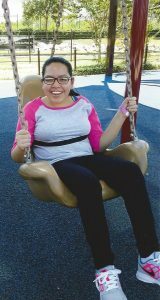 She is challenged each day with cerebral palsy, severe mental deficits, and many other diagnoses. She is nonverbal and she also can only walk or sit upright with assistance. She is a brave girl who has frequently been hospitalized, but she is described as loving life and having a strong will to live. Bianca can thrive in the moment by having fun. She listens to children’s music, and her favorite song is the classic “Itsy Bitsy Spider.” She sings the song while pretending her fingers are the spider crawling up the water spout. Bianca likes art, as well. She spends her time painting in a style that is all her own. During days with nice weather she will go outside and play on the swings. She loves the exhilaration of feeling like a bird in flight. Bianca’s illness might be daunting, but this child is dauntless. Bianca is a happy girl! 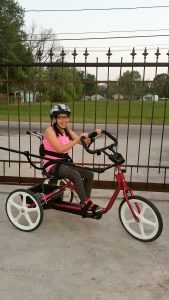 She is enjoying her new adaptive tricycle which will help her posture and help strengthen her muscles. Go Bianca!